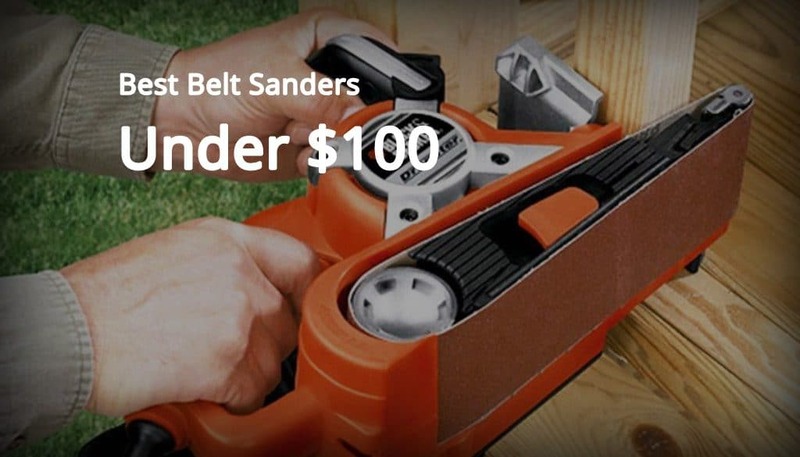 The belt sanders are real workhorses, they are the heavyweights when it comes to sanding. 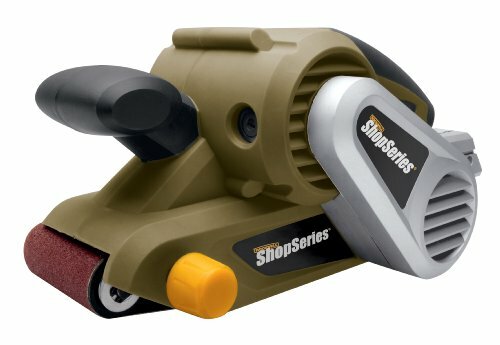 They can be used for fine trimming, smoothing and leveling rough surfaces, rounding corners and edges, or freehand shaping. Carpenters rely on the top rated sanders to dress the edges, smooth and flatten big glued-up tabletops as well as other panel assemblies that are too large to work with a typical surface planer. If someone asked me what belt sander to buy without spending more than $100, I’d recommend the Black & Decker Dragster DS321. The Dragster is a 3 X 21 inches belt sander with robust construction, thoughtful design, and refined performance. It’s an aggressive tool with good sanding power that shapes as well as removes a large amount of stock quickly. If you’re thinking about buying this sander, it will certainly prove to be a great addition to your home workshop because of its versatility and relatively low cost. However, if you need to do serious sanding, like a large deck, you may have to look to other heavy-duty options that are going to cost you more. The best belt sanders have a reputation for being rough-and-ready, aggressive jobsite machines and resourceful home workshop tools. They can remove great amounts of stock in a hurry, which makes them suitable for smoothing flat, large surfaces or removing planer marks. That said, getting a real smooth surface depends mainly on the design, speed, power, comfort and control, and other features of the sander. We’ll discuss all of these features in the below section. The speed at which stock is removed depends on the speed as well as grit of the belt, the contact area (i.e. the area of the belt in contact with the surface of the wood), and finally the sanding pressure exerted by the operator. Belt sanders with wider belts or longer platens have a fairly higher degree of contact with the work, so they all sand quickly, all other factors being the same. Finally, faster speeds doesn’t necessarily mean better with belt sanders. Higher belt or disc speeds are more likely to leave burn marks on your work. Stock removal requires high motor power. As simple as that. Higher speeds, heavier sanders, longer platens and wider belts all require powerful motors. If there is not enough power delivery, the motor slows down, heats up a lot and at times burns out. Generally, any increase in operating pressure or contact area, belt speed, will necessitate a significant increase in motor power. Furthermore, the belt sanders with highly powerful motors, combined with large belts and platens, will sand faster and remove stock faster. By using the right sanding techniques, you can perform handy tricks with the best belt sander. For one, running the sanding belt diagonal to the grain results in quick stock removal especially when you are working with a glued-up wood panel. There are several tips for getting the most out of that little tool. Once you gain a mastery of it, you’ll find that the belt sander can perform all sorts of tricks for you. Most sanders in the market have a special adjustment knob to keep the belt aligned and tracking accurately. Yes, not all sander tools out there come with a tracking lock feature. But the best belt sander is supposed to have the track lock mechanism in place that helps avoid the belt from drifting off as sanding takes place. Belt release is quick, time-saving feature that comes in handy whenever you are having to change the belt without having to turn a tensioning screw. Belt sanders, in general, kick up clouds of fine dust which not only mess up the wood shop but also present a greater threat in form of health hazards. Therefore, it becomes real important to consider buying a belt sander with efficient dust control. Most sanders have a standard or optional dust bag- some belt sanders have special ports that can be plugged to a shop vacuum. Even though this hookup arrangement can make sanding more awkward in a few cases, it’s quite effective. Although many sanders that we tried did a fairly better job of collecting dust than others, (the Genesis, the Ryobi and the Black & Decker are particularly clean machines) all belt sanders kicked out a good amount of airborne dust, so we strongly recommend wearing a dust mask for extra protection. But the Dragster has a small front roller that makes corners easy. Presumable Black and Decker gave it the name because the angled belt and big back rollers give it the profile of a drag car. It even has a flip-up front hood to let you get in even closer. This could be a safety draw-back if you aren’t careful with your fingers, but it’s handy for eyeballing precise sanding jobs. It also has an adjustable 3-position handle for putting leverage from you choice of angles. It has a dust collection feature where you can attach a small bag or vacuum. All in all this design gives the Dragster a nice balance which makes it easy to work with and control. The 7 amp motor and 3×21 belt make this a mid-range sander suited to either small or large jobs, but even it has limitations. Working with really rough grits under 60 can cause the motor to hesitate. And unless you have the vacuum attached, the inner workings can get caked with sawdust after several minutes of work. It’s best to stop and shake this out once in a while if you don’t have a vacuum handy. Dragster is perfectly suited for light to moderate finish work, and in some tight corners. Textured rubber grips provide comfortable, precise, non-slip control. Flush sides allow sanding close into perpendicular angles, which is great for sanding floors or counters right up the wall. A removable auxiliary handle can offer even better control when two hands are needed. There is even a grip at the cord exit for helping to sand from odd positions. It has a removable dust port for shop vacuum hook-up, and a dust-sealed, recessed power switch is accessible while minimizing accidental turn off. The Porter-Cable 371 has many metal components that make it durable enough for rough outdoor carpentry work. Yet it is small and light enough to carry along for making repairs around the house, maneuvering to sand auto body work, and small but completely suited to most woodworking applications. If you’ve got a lot of work to do, a small sander with plenty of power is just what you need, especially the 371 which is easy to control with even one hand. But that does bring up the one negative, which is that after long use those metal surfaces can become hot to the touch. But putting on a good pair of gloves overcomes that, and the Porter-Cable 371 goes on working. This may be because the 5 amp motor is a little small for rough sanding, but small is what you should expect in a compact design. It’s still power enough for all but pro wood working and takes the abuse well. 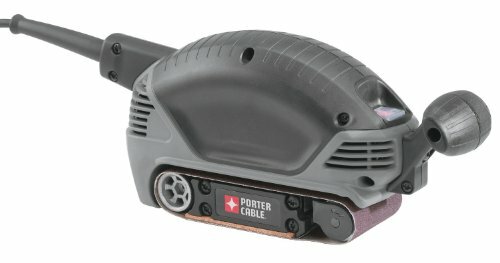 The Porter-Cable 371 is the perfect sander for newbies or home workshops. It’s lightweight, powerful for it’s size, and comfortable to work with. Adding a vacuum hose makes it almost dust-free to minimize clean up. It does get hot if over-used, and it’s a little small for really large sanding jobs, but it’s a great choice for the average DIYer. The SS4300K has a lock-on switch for continuous use, a quick-release belt system for easy changes, and a variable speed control to adjust to a variety of materials. The relatively light weight dual handle design with soft grips makes it comfortable to work with on even big jobs. The SS4300K comes with a dust bag, one 80-grit belt, and a durable carry case. A bulky plastic design makes it cheap-looking, but it works well and is very sturdy. Rockwell is known for making quality sanders. This model comes with a tracking knob to adjust the belt which works well. The SS4300K has plenty of power, and the speed control is accessible and easy to use. It stands up to a heavy work load and will fit in even in most professional wood working shops or carpentry jobs. If the SS4300K has any drawbacks, it’s the dust collection system. The connector is a fairly flimsy plastic port that doesn’t hold the bag quite securely enough, and doesn’t permit a vacuum hook up. So it can be a bit messy. And it is louder than expected. But those two things seem like minor issues for a reliable, powerful, and affordably priced belt sander. 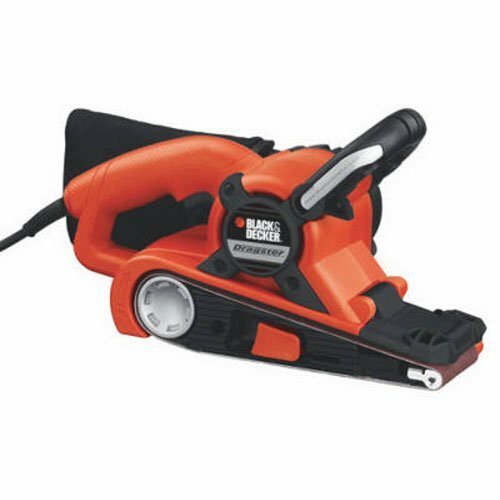 The Rockwell SS4300K is a workhouse, not just a hobby sander. It can handle the big jobs. Yet a light weight, fully functional features, and comfortable controls make it suited to any DIY project.